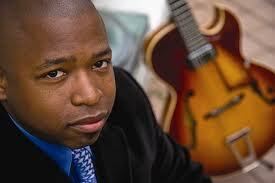 Bop Central and Reflections In Rhythm present Grapes & Grooves Jazz and wine tasting featuring guitarist Terrence Brewer Sunday July 17th, 3 to 6pm. Regarded as one of the truly creative voices on his instrument, Terrence has steadily gained national attention and support through his five independently released recordings on his Strong Brew label. Appreciated for his warm tone and tasty melodies Terrence has established himself as a skillful improvisor and an engaging composer. In addition to leading his own bands to standing ovations for sold out crowds at the world famous Yoshi’s at Jack London Square, Yoshi’s San Francisco, Jazz At Pearl’s, the Russian River Jazz Festival, SFJazz Festival, Fillmore Jazz Festival and the Monterey Jazz Festival Terrence has enjoyed working with such luminaries as Michael McDonald (Doobie Brothers), Mary Wilson (The Supremes), Gerald Albright, Dr. Anthony Brown, Pete Escovedo, Dave Ellis and Calvin Keyes among others.